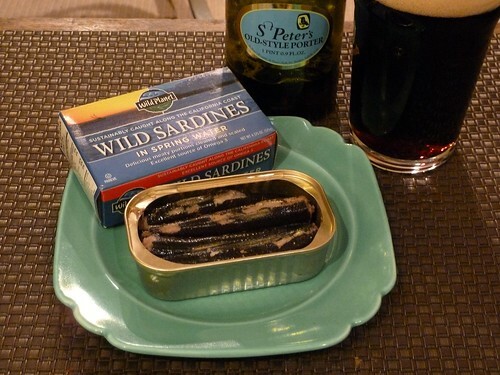 Society for the Appreciation of the Lowly Tinned Sardine: Hot Sardine! Oh. Hello. I didn't see you there. Have you been there long? The Clubhouses have been quite quiet lately. Just a couple of crusty old men over in the corner of Oregon, drinking beers and talking about how they used to have the Premier Tinned Sardine Website in the Blahgoshpere. Lying to each other about the cross races they never finished. Here in Northern California tins have been consumed and forgotten but not anything You haven't seen before. And I've been drinking beer and lying about cross races I never started. The Wife is in class and I'm home alone with a variety of St. Peter's and the latest issue of Eating Well. And wouldn't You know it; there's an article with four Canned Tuna recipes. As I've said before, "Any Tuna Recipe, Anywhere, Anytime." The first recipe I've kind of riffed on before. The second recipe looks good but not for tonight. The fourth recipe must be tried. Tuna Sardine mac & cheese takes a trip to the Southwest with spicy tomato and festive blue tortilla chips on top. Canned tomatoes with green chiles and ancho chile powder add a peppery kick, but if you like, you can keep it mellow by using a 14-ounce can of drained petite diced tomatoes and mild chili powder. Cook pasta in a large saucepan of boiling water according to package directions. Drain and rinse. Meanwhile, whisk flour and 2 tablespoons milk in a small bowl. Heat the remaining milk in a large ovenproof skillet over medium heat until steaming. Gradually whisk a few tablespoons of the hot milk into the milk-flour mixture, then whisk this mixture back into the skillet. Cook over medium heat, stirring constantly, until the sauce is smooth and slightly thickened, 1 minute. Remove from the heat and stir in Cheddar, pepper Jack, chile powder, salt and pepper. Puree cottage cheese in a food processor or blender until very smooth, scraping down the sides as necessary. Stir into the sauce in the skillet. 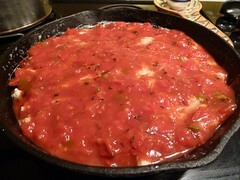 Add tuna Sardines and the pasta; stir well to coat with the sauce. Sprinkle drained tomatoes evenly over the top. Bake until hot and bubbling, 20 to 25 minutes. 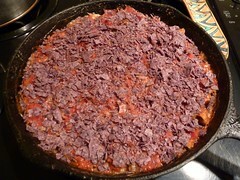 Top with crumbled tortilla chips. I don't want to spring a new tin on You without the Wife (I have one or two) so I'm reaching into my case of Wild Planets. I'm choosing the In Water as the tuna product recommended is. Also I don't have much taste for Tinned in Water. Cooking with them seems appropriate. I shopped at the Bowl for all the ingredients, as local and organic as possible, and kept to the recipe as best as I could. I'm popping two tins, one doesn't seem enough, two's too many. Four big fish, skin no bones. 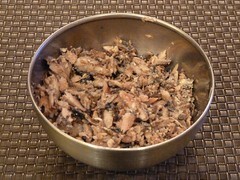 I put 6 in the recipe, ate one (so very tuna like) and gave one to the dags. That was just fine. Nice spice, a bit crunchy from the chips. Don't crunch the chips so fine and add more for that wonderful trashy crunch. It wasn't over cheesy. I might have cut back a bit on the cheese. I over cooked the pasta just a little; the whole wheat is nice. The sardines are subtle and delicious, kinda wanted more, two tins instead of 1 1/2. This has possibilities. Three out of Five Tins. I bet this turned out pretty good! I eat sardines out of the can all the time. I like them oily, fishy, salty and full of scales :) Portuguese are my favorite. Sometimes I add them to pasta, patés, etc. They are very versatile. Sometimes I get fresh ones at sun fat a great fish market in the Mission at 23rd. Lots of work but well worth it. Bought a few tins of Wild Planet last week. Came here to see if you had reviewed because I thought they were DElicious! 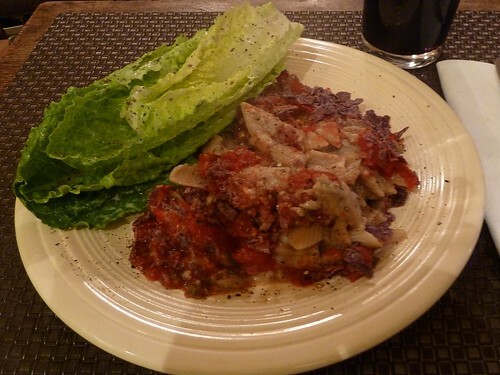 Great idea substituting sardines for canned tuna. I'm going to try Nutty-Thai sardine salad! I don't want to spring a new tin on You without the Wife (I have one or two)...Wives or tins? soo happy to see a new post! Good to see you back. Happy belated new year (both western and Chinese).